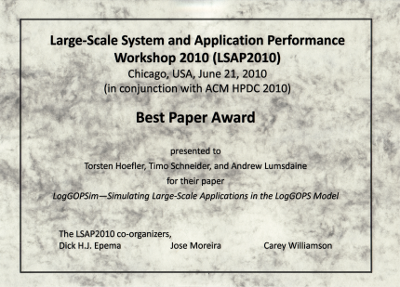 This week, I attended the Workshop on Large Scale Application Performance in Chicago. I was shocked when I arrived at HPDC (sidenote, I took the train again and it was great! ): everything seemed to be about Cloud or Grid or a combination of those (+Life Science). I still don’t fully understand what all this stuff is about and what the fundamental scientific problems are. Well, the workshop was very good! I really enjoyed Barton Miller’s keynote about his MRNet research. It’s good work! I also enjoyed listening to the other workshop papers. My talk went really well (I was a bit over-time but that wasn’t bad). We (Timo, Andrew and me) even got the best paper award for our work! That was nice and unexpected. All-in-all, it was a really good workshop! This weekend, I attended the Advances in Message Passing workshop and the Supercomputing 2010 PC meeting. AMP was in Toronto and the SC meeting in New Orleans. Well, and the schedule was suboptimal. I had to leave AMP early and catch the last flight from Toronto to New Orleans (7pm). But AMP was clearly worth it! It had a couple of very interesting papers and our own contribution fir very well too! I gave the talk together with Jeremiah (which was an experiment ) — and it was a complete success! The SC meeting was very nice. I met many friends and colleagues and had many good discussions. New Orleans is not really the nicest place I have been to. 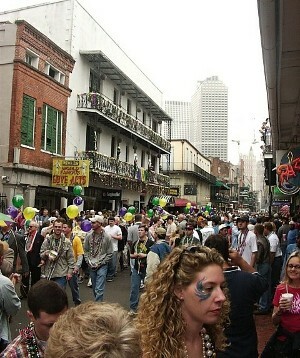 I tried to save money and stayed in the “Bourbon Inn” — well, on Bourbon Street. I did not know what Bourbon street meant when I booked the hotel :-/. Well, it meant no sleep until around 3am . The street is full of night- and stripclubs … kind of odd when you walk back to the hotel after a full day of meetings. Well, I survived (and saved $150). Also, taking the bus to the airport was an adventure. I also survived this one . Bourbon street (the camera didn’t really work because it was *extremely* humid! ).